Analogous to a musical composition, each circuit design is unique and individualized. Innovative thinking, persistence, and passion are important to both research and our personal lives. Emory Enroth graduated with a B.S. in Electrical Engineering from the University of Utah in 2015. 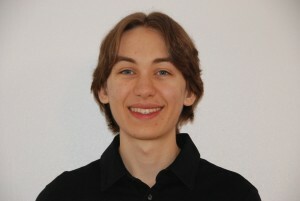 He is currently an ECE student in the PhD program at Cornell University. When away from school, Emory heads to the mountains to bike and snowboard. If he finds spare time, meticulously detailing and polishing his truck or practicing piano and hammered dulcimer are relaxing pastimes. Screen capture of a variable resistor block before metal fill. His current research interests broadly fall in the area of wireless transceiver design. This includes the development of application-specific power amplifier topologies. Ongoing projects are being designed in 28nm CMOS and 130nm SOI processes. Past research at Cornell included the design of coupled inductors for implementation in an on-chip transmission line.